The fund advisor is Vanguard Equity Investment Group. It is managed by Gerard C. O'Reilly since 1994. This large value mutual fund is tracking the CRSP US Large Cap Value Index. The expense ratio fee is only 0.24%. This investor class has 318 holdings. You can buy this fund for your brokerage or retirement account with as little as $3,000. You may also find other classes of this mutual fund. The other classes are Admiral Class (VVIAX), Institutional Class (VIVIX), Signal Class (VVISX), and ETF (VEA). The admiral classes fund has expense fee of 0.09%. Morningstar has ranked this U.S. stock fund with 4 stars and silver rating. In 2014, the year-to-date return is 8.01%. This equity fund has returned 19.25% over the past 3 years, and 13.08% over the past 5 years. Top 6 stocks in its portfolio are Exxon Mobil Corp. (XOM), Microsoft Corp. (MSFT), Johnson & Johnson (JNJ), Wells Fargo & Co. (WFC), General Electric Co (GE), and Berkshire Hathaway Inc (BRK.B). Top 5 sectors in its assets are financials, healthcare, industrials, oil & gas, and technology. The investment risks are stock market risks, index tracking error risks, investing style risks, etc. 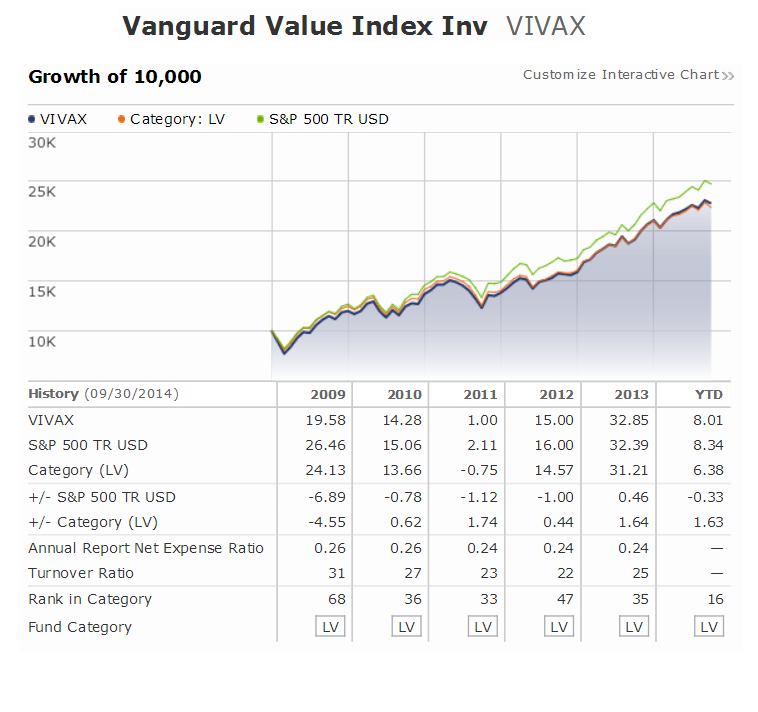 This Vanguard Value Index Fund has a low expense fee. It has high dividend yield for income.